Grimes Family Fluffers | Professional breeders of Grand Champion-quality Flemish Giant and Thrianta rabbits. Professional breeders of Grand Champion-quality Flemish Giant and Thrianta rabbits. Our Rabbitry. What started with a couple of rescues and a rabbit purchased as a pet has become a family hobby and mission; to breed happy, healthy show rabbits and pets – or “fluffers” as they’re referred to here. 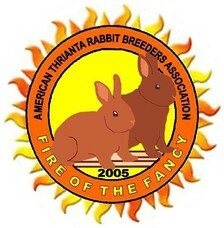 Although our rabbitry is still home to several rescues, we focus on breeding Flemish Giants (primarily black and some fawns) and one of the newest recognized breeds in the U.S., Thriantas. We maintain an air conditioned, enclosed facility to keep them cool in the summer, and have open air hutches spaced around our shaded gardens so they can be outside during the cooler months. Our Family. In his free-time away from the rabbits, Mike Grimes is a Corporate Chef. (While he does co-author the culinary column in Domestic Rabbits, the magazine of American Rabbit Breeders Association, he doesn’t serve them at home; our rabbits are friends, not food.) Tami Grimes is a college professor specializing in advertising and marketing topics, creativity and strategic communications. Her rabbitry-related tasks are naming the babies, nursing the occasional tummy ache, and making sure everyone is adequately loved; rabbits and family alike. Their son, Michael, finds time for NASA historical studies, computer aerospace design and occasionally even his homework. Most of his time is spent spoiling his fawn Flemish, Amy. Our Fluffers. We firmly believe that happy bunnies are healthy, well mannered bunnies. We treat our rabbits like the intelligent, affectionate creatures we recognize them to be. Each of our rabbits is held and loved every day; from the day of their birth, to the day they leave us. They spend long hours running free in our enclosed yard, digging, playing, and exploring. This freedom and exercise results in our rabbits having more defined muscle tone, better overall health, and brighter attitudes. In the evenings some of them take turns lounging with us on the sofa, and we litter-train the babies as much as possible before they leave for new homes. Whether you’re looking for a show-stopping champion rabbit, or a cuddly bunny to make you smile, we believe you’ll find both in every Grimes Family Fluffer.